Entrepreneurship is often thought of as an art, a skill you hone over time – but is there a science to it too? That’s what The Startup Genome Report, a new in-depth study, set out to discover. Based on information submitted by over 650 Internet startups, the report sets out clear stages of a startup’s development and identifies distinct types of companies. The project aims to make this data available widely in order to increase the success rate of startups and accelerate pace of innovation around the world. The result of responses from a total of 666 startups, the report is a compelling first draft at turning entrepreneurship into hard data that could help founders and investors measure the success, and failure, of Internet startups. The full report (which you can find here) is a lengthy document, but well worth spending time with. We’ve boiled down some of the key points and some of the most interesting findings over the next few pages. So, read on to find out about the different types of startups, the stages of development they go through and some of the interesting information uncovered by the report. One of the key ideas that the Startup Genome Report set out to test was that startups evolve through specific, discrete stages of development, and that each stage can be measured with specific milestones and thresholds. After interviewing numerous VCs, the research team found that better performing investors saw startups as a ‘search process’ for product market fit and a scalable business model. These VCs based the decision on whether to fund a startup on subtle data points such as the team’s pace of learning, why they made certain pivots, the body language between the founders and stage specific metrics. This contrasted with less well performing VCs who just looked at broader considerations, such as the team, the market and current traction. As a result, the researchers set out to identify the subtle patterns behind different startup milestones. 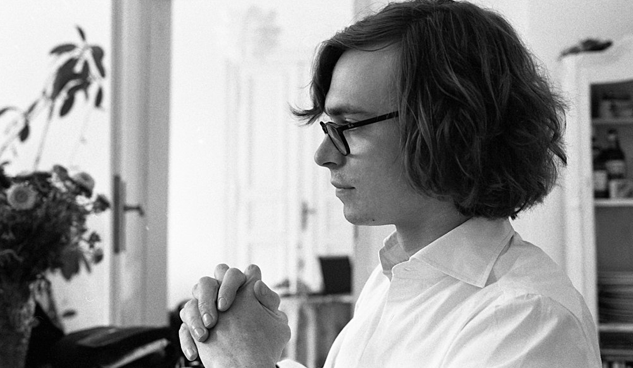 Six stages of development, named ‘Marmer stages’ after the project’s co-founder Max Marmer, have been identified. The first four, which the report looked at in detail, are based on Steve Blank’s 4 Steps of the Epiphany, but with an emphasis on a startup’s product, rather than the company itself. During this stage, which typically lasts 5-7 months, startups work out whether they are working on solving a meaningful problem and whether they have a potential audience. Typically, ‘Friends and Family’ financing rounds take place and the team may join an accelerator or incubator. Here, startups are looking for validation – either through attention from users or from people willing to pay for their product. Core product features are refined, seed funding is found, key hires are made and pivots take place if necessary. On average, this stage lasts 3-5 months. On average, startups at this stage have raised $600,000. Startups at this stage look to refine their business models, improving the efficiency of the customer acquisition process. Viral growth is achieved, the conversion funnel is optimised and the user experience is overhauled as required during this 5-6 month average stage. Startups surveyed at this stage had raised an average of $900,000, although the team behind the report recommend holding out until startups have reached Stage 4 rather than investing in them now as they should focus on efficiency which shouldn’t require additional funds. This is all about rapid, aggressive growth. With an average span of 7-9 months, startups here see large-scale customer acquisition, back-end scalability improvements, their first executive hires, departments established within the company and a sizeable Series A investment round of $1.5m-7m, depending on the type of startup. The report also identifies Stage 5: Profit Maximization and Stage 6: Renewal, but will study them in depth in a later publication. Interestingly, the report finds that different startups take different amounts of time to make their way through the Marmer stages. Integrators are fastest, closely followed by Automizers and then Social Transformers. However, Challengers can take significantly longer, averaging nearly 70 months as opposed to a little over a year for integrators. Based on their analysis, the researchers identified four ‘personality’ types for Internet startups. The theory is that startups require handling by investors, and indeed their own founders, in different ways depending on their type. For now, the team has based its four types on customer acquisition factors, but plans to take other factors into account in future reports. The Automizer: Self-service, consumer-focused offerings that often automate a process. Examples of Automizers include Google, Dropbox, Mint, Groupon and Zynga. The Social Transformer: The Automizers, these startups offer self-service and consumer-focused products but operate in ‘winner takes all’ markets and typically offer products that give customers a new way to interact with others. Examples include Facebook, Twitter, eBay, Skype, Airbnb, Flickr, LinkedIn and Foursquare. The Integrator: These enterprise-focused startups target the SME market and look for early monetisation, often transferring innovations from consumer products into the enterprise market. Integrators include PBworks, Uservoice, Kissmetrics, Zendesk and GetSatisfaction. The Challenger: Challengers operate in the enterprise market with high customer dependency and a repeatable sales process. Look to Salesforce, Oracle, MySQL, Redhat and Yammer for examples of this type of startup. It’s not quite as simple as that though. The report notes that startups which monetise indirectly (i.e., through advertising rather than directly charging users) have a sales “Wing”. So, an Automizer may have a Challenger wing, for example. The full report goes into detail, looking at how factors like team size, funding behaviour, types of markets, likelihood of a pivot and speed of growth differ between startup types. Having identified types of startups and the stages of development that they go through, the researchers were able to uncover some interesting findings. Here are three of the most striking. One of the most interesting points raised in the report is how a good quality mentor can directly affect the funding a startup receives. As the graph below shows – the difference is stark to say the least. Those startups with a mentor that they found helpful raised a lot more money. Surprisingly, the report found that beyond funding, mentors had very little effect on the success of startups. The team believes that this is because the good entrepreneurs who lack mentors to, for example, give them introductions to useful contacts, will always find a way to do this themselves. While a pivot may sometimes seem like a last resort measure for startups, one or two pivots may actually be something of a sweet spot. The report found that startups which pivot once or twice raise 2.5 times more money, have 3.6 times better user growth, and are 52% less likely to scale prematurely than startups which pivot more than two times or not at all. 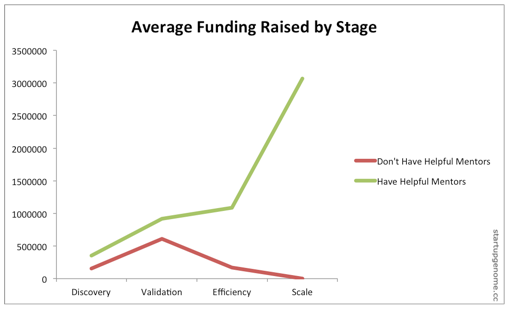 As the chart below shows, money is rarely the chief motivation for tech entrepreneurs. 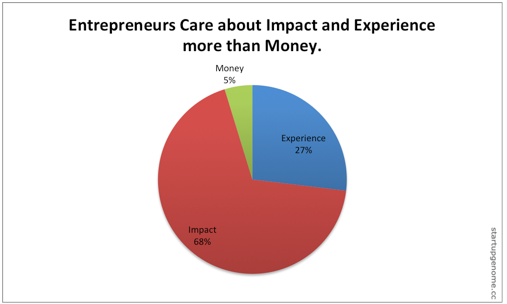 Making an impact motivated 68% of the startups surveyed, gaining experience motivated 27% and money motivated just 5%. Today’s publication isn’t the end of the Startup Genome Project. A new survey for startups has just gone live, with the aim of gaining even more data to help delve deeper into the ‘genetic code’ of Internet startups. Not only that, it can help entrepreneurs understand the stage their startup is in and gives them personalized tips and advice for what to focus on based on data from the startup genome project. If you’re a tech entrepreneur and would like to take part, you can find more information here. A self-assessment tool in the form of a Web app, designed to let startups work out exactly what type they are and what stage they’re currently at is also in the works. The work that has gone into this report is enormous, and it will be interesting to see if startups and investors alike begin to refer to it as they make important decisions in the future.